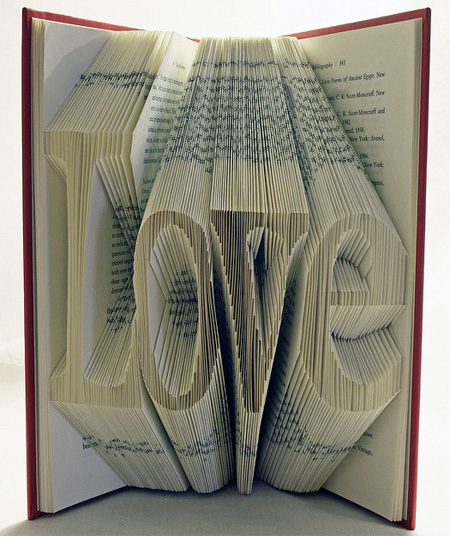 Isaac Salazar creates three-dimensional works of art out of recycled books. 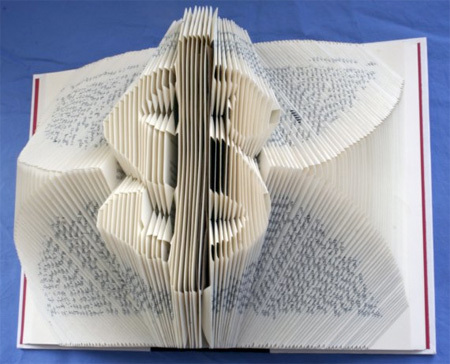 The artist carefully folds each page to resemble symbols and words. why the hell is twilight here, and not harry potter???? I agree with He who must not be named– Where’s the HP? I was loving these until I saw the Twilight one. It disappointed me a little, but still. Awesome collection and great idea. How people create awesomeness out of little common sense, a few folds and the right imagination. I hope the artist read the books before. Wow…amazing…how do pple get such ideas!!! Just an FYI to those who forgot…the word “twilight” still exists in the contexts of its definition of an early morning/evening sky–not just the $hitty movie ! OHHHHH NOOOO!!!! HOW CAN IT BE…. 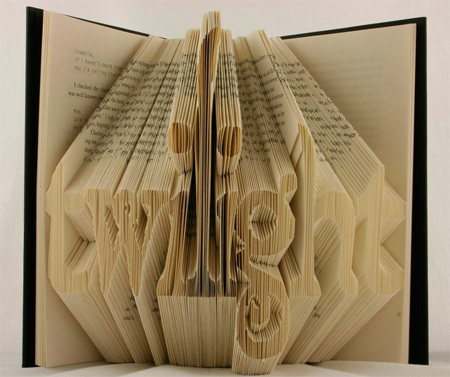 that book says……”TWILIGHT”!!!! IS THIS REALLY HAPPENING? I’M WAAAAAY TO HIP to even seeeeee the word “TWILIGHT”!!! -Awesome work by the way! these are all really great. the recycle one blew my mind! Though I’m not a fan, I believe Twilight is an easier font to work with. 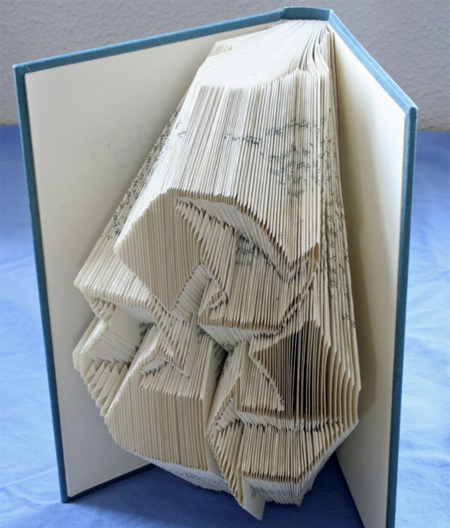 The artist probably couldn’t bear to fold up her/his Harry Potter books, since they are more valuable. I dont get it, how do you know that its twilight books? This is pretty cool. The effect is amazing! Red Grooms did a portrait of Franz Kline by carving into a NYC phone book. Amazing creativity, the time and skill involved with creating these are brilliantly demonstrated. 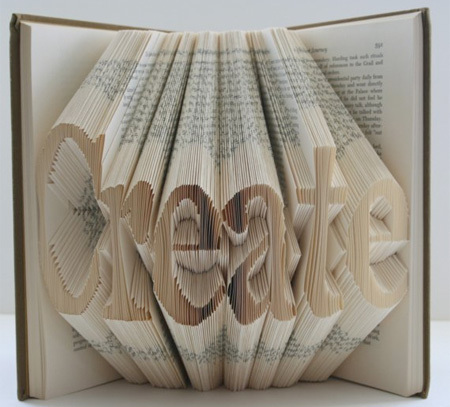 And really, does it matter what name is created within the pages of a book. Literary taste isnt whats on show here people!! you should name the books, surely thats half the artistic point? I am guessing the Faith one is the Bible. and Twilight is the book of the same name but what about the others? 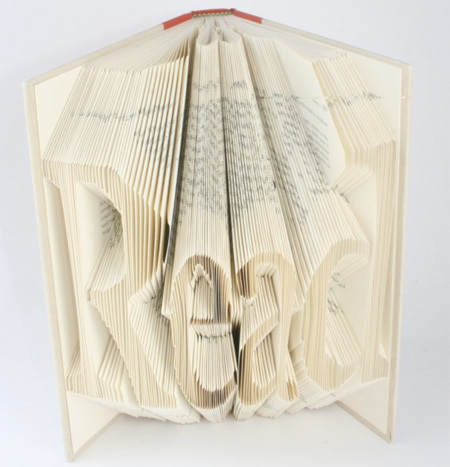 the “read” one is pointless; SINCE YOU ARE DESTROYING ALL THE BOOKS! aaargh! 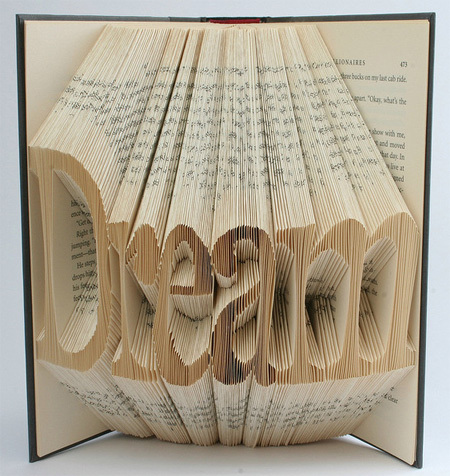 nice and whatever it may be, but books are my life, dont go about wasting them!! whatever happened to “aww the poor trees, how will they survive”!!!!! still kinda cool i have to admit…. 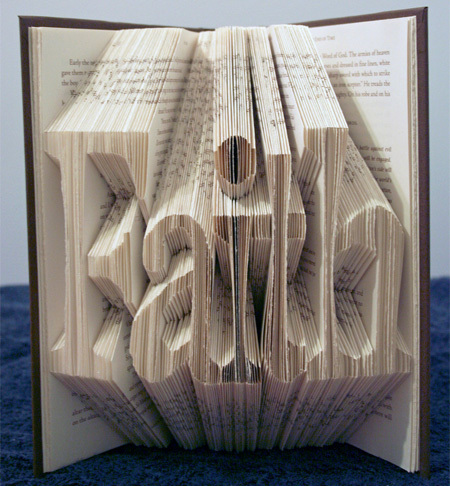 There is only one book I would like to do this to, and that is my math book. well, people actually READ harry potter..